• NEW! What's Wrong With Backyard Eggs? • "Free Range" Eggs - Can You Tell The Difference? "Free-Range" Eggs – Can You Tell The Difference? • Debeaked with a hot bloody blade at one day old with no anesthetic. • Force molted (intentionally starved to shock the body into another laying cycle). • Violently packed into a semi and trucked hundreds of miles to an agonizing slaughter when considered “spent” (unable to keep laying eggs at a fast enough pace). • Denied the opportunity to live a natural life in truly humane care. • All of her brothers (roosters) are brutally killed as baby chicks simply because they can’t lay eggs. Some animal rights organizations have made tremendous strides in educating the public about what exactly occurs in battery hen operations. They have exposed the ugly truth, such as tens of thousands of hens crowded into long, poorly ventilated, completely dark sheds, fully automated feeding and egg collecting systems, filth, death and suffering. The recognition of how horrible the short lives of “battery hens” are has led many people to stop contributing to this atrocity by simply not buying those eggs. Unfortunately, many other people have looked to so called "Cage-Free/Free-Range" eggs as an acceptable and humane alternative. 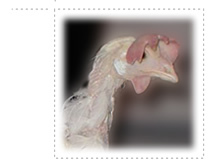 Sadly the public is led to believe that "Cage-Free" hens live a happy, natural life. This is simply not so! "Cage-Free"/"Free-Range" hens come from the same hatcheries that battery hens come from, all of their brothers are killed by suffocation or being ground up alive, the girls themselves endure the same bodily manipulations and mutilations, and they ALL ultimately end up at the same slaughterhouses when their "production" declines. I am often asked "Don't you think it is still better that people buy 'Cage-Free' eggs rather than battery produced eggs if they are going to buy eggs anyway?" I feel the person actually wants to believe that their consumer dollar is not paying for someone else to commit animal abuse, when in fact it is – no matter what production means were used. It is like asking if I think strangulation is better than suffocation. My answer is: Neither is an acceptable option. There is simply NO way to humanely produce eggs for human consumption. First, I would not want anyone to buy "Cage-Free" eggs if they are doing so because they have compassion for the animals and convince themselves that they have made a humane choice. One of the most destructive things we can do for the animals is to lie to ourselves, or allow ourselves to be fooled an misinformed into believing that animal agriculture of ANY kind is humane. Second, the so called "Cage-Free" or "Free-Range" eggs are produced with an exorbitant profit margin in comparison to battery produced eggs. Therefore, well meaning consumers will be unwittingly padding the already thick pockets of egg producers, hatcheries, and poultry slaughterhouses, which will only allow them to increase the size of their operations and advertising budgets, which will in turn lead to even more suffering. Third, the question forgets the most obvious choice: Don't buy eggs at all. Once people allow themselves to entertain the possibility of living egg-free, it's quite empowering. They suddenly realize that Yes! It can be done. Millions of people before them have cut eggs and products made with eggs out of their lives and are doing just fine! Not only vegans, but millions of people from other cultures don't eat eggs. 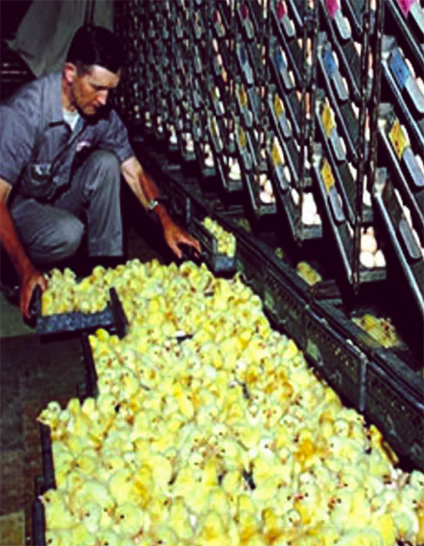 Why there is no such thing as "humane" egg production on ANY scale, no matter how small – in a nutshell. The most important and most overlooked ethical aspect of human consumption of hens' eggs is that, for every egg laying hen at the farm, a rooster chick has been murdered at the hatchery. No matter where the egg production facility is, what its size is (large farm or backyard operation), and no matter what the 'visible to the public' conditions are, the egg-laying hens are obtained from the same hatcheries that kill the baby rooster chicks at only one day old. If the "free-range" farm hatches its own chicks, two important questions still remain. 1. 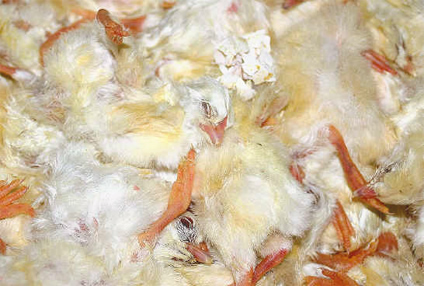 What happens to ALL of the male chicks - not just few token roosters - but ALL of them? 2. What happens to the hens when they are no longer laying enough eggs for this facility to be profitable? If the spent hens and ALL of the roosters were allowed to live out their lives until they died a natural death - chickens can live well over a decade - then that farm would soon have thousands of "spent" hens and roosters to care for. Obviously, the lifelong care of all of those birds, at all stages of a natural life span, would cut severely into any profits made by selling the eggs of younger hens. So what happens to ALL of the boys? And what happens to ALL of the "spent" hens? Hens are generally considered spent by egg-laying facilities at one to two years — meaning, the farm then has to provide predator-proof shelter, food, veterinary care, etc. for that same hen, for another decade. The roosters will require dozens of separate yards, predator-proof shelters, food, vet care, etc. for their entire lives. In order to make a profit, the numbers simply don't add up unless the inevitable killing of roosters and spent hens is occurring. The males are killed hours after birth and discarded as trash. 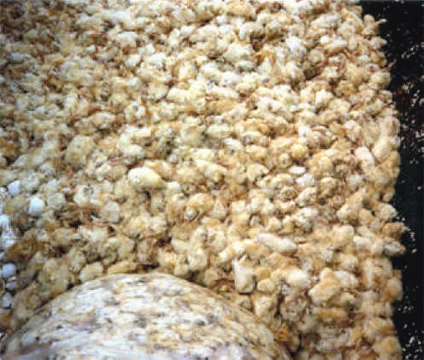 The females are sold into egg production. "I was chosen for a special assignment, in the hatchery. 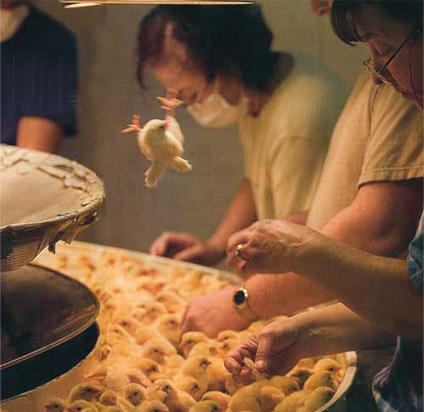 The rooms were silent but for the faint hum of machines, the air hot and humid, so that when we levered out the huge metal trays of newly hatched chicks from the oven-like incubators, the yellow fluff balls chirruped cheerfully. A sea of yellow beings jostled among broken shells. If you want to present this video on a large screen, please contact us at info@peacefulprairie.org and request a high resolution version. When showing The Faces of "Free-Range" Farming, we strongly recommend that it be accompanied by our complementing literature, for complete information on the imperative of living vegan. Click here to download the "Free-Range" Myth PDF flyer and print your own.